Evening Primrose Lotion with Avocado Oil from Aubrey Organics is a luxurious conditioning lotion that provides special, gentle care for dry, stressed skin. Evening Primrose Lotion instantly soothes and hydrates with organic evening primrose oil, a rich source of gamma-linolenic acid, and other herbal emollients. Aqua, aloe barbadensis leaf juice*, oenothera biennis (evening primrose) oil*, myristyl alcohol, alcohol denat. (38b, lavender), triticum vulgare (wheat) germ oil, glyceryl stearate, cetearyl alcohol, leuconostoc/radish root ferment filtrate, stearic acid, glycerin, glyceryl linoleate, glycine soja (soybean) oil, sodium cocoyl glutamate, fragrance***, citrus grandis (grapefruit) extract, persea gratissima (avocado) oil*, ascorbic acid (vitamin C), glyceryl linolenate, echinacea purpurea flower/ leaf/stem extract, lavandula angustifolia (lavender) oil*, calendula officinalis flower extract, tocopherol (vitamin E), tocopheryl acetate, cinnamomum camphora (ho wood) oil, hamamelis virginiana (witch hazel) extract, glycine soja (soybean) oil**, arnica montana flower extract, beta-carotene**, daucus carota sativa (carrot) root extract**. Shake well before using. After showering, or any time, apply lotion all over, concentrating on dry areas. I love this lotion and the lavender and primrose soap. I just use it all over, even on my face... it is simple but it really works... thank goodness for simplicity. I just love it. Thank you so much. Love this product. It soaks in immediately and moisturizes. One reviewer said they did not like the fragrance. Whereas I love the fragrance, I think you have to really like, for lack of a better term, *earthy* fragrances. This will not smell like other products (i.e., the typical heavy floral, fruity, spicey, or pharmaceuticalish). 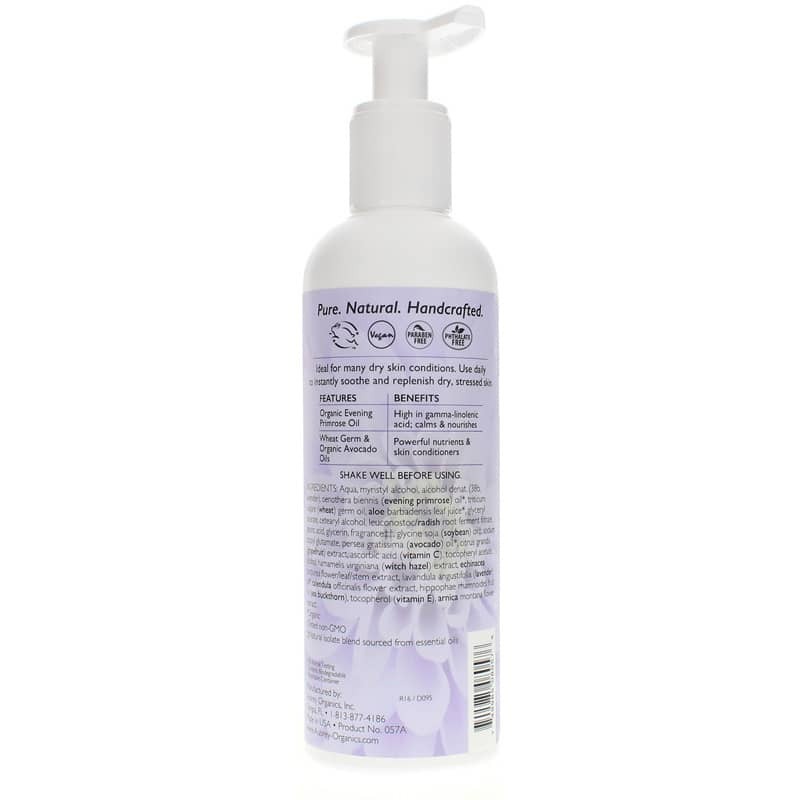 Evening Primrose Soothing Moisturizing Lotion is the most wonderful lotion I have ever used. It absorbs quickly and completely with no greasy feel. It is the only moisturizer I buy anymore. I even use it on my face. My daughter-in-law was suffering with gestational diabetes and had developed lesions on her feet that the prescriptions from the doctors would not heal. This lotion cleared them up in less than a week. She is a teacher and has to be on her feet quite a bit, so this lotion was a life saver for her. Personally, I just love the way it makes my skin feel like that of a new born baby. I have used Evening Primrose Soothing Moisturizing Lotion for years. It leaves my skin feeling like that of a newborn baby. I've been using this for over a month and I really like it! It helps lock in moisture on my dry skin. The scent is subtle and pleasant. Will definitely continue using this lotion. Plus it has all the natural good stuff in it, not the bad :hearts:ï'!ï'!